[toc]Diarrhoea is a common form of diseases that affects people of all the age groups. At first, diarrhoea is only an acute trouble but later it might get transformed into a chronic disease. Diarrhoea actually means defecating more than 200 grams in one day. This is a condition where fluids do not get absorbed in the colon because the food either passes too quickly or in large quantity. Bacterial infection, food poisoning and intestinal diseases are common causes of diarrhoea. Though, rotavirus mainly causes diarrhoea in kids and Norwalk in adults. But the treatment of diarrhoea must not begin immediately after the beginning of the symptoms. This disease is a natural way for your body to get rid of the toxins. And if we suppress these toxins, especially those caused by food poisoning it will only make the matter worse. This disease can lead to dehydration in children and old aged. Therefore, the treatment for the young and old must begin within 2-4 hours of the onset of disease. If diarrhoea has taken place due to some prescription or non-prescription drugs then discontinue that immediately and consult your doctor. But if diarrhoea has been caused by food poisoning then it will subside within 6 hours. 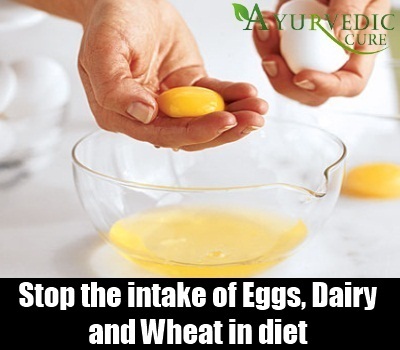 For the time being you must stop the intake of eggs, dairy and wheat in your diet. These food products are high allergens and can only make the situation worse. You must switch to eating rice, soy milk, yoghurt etc. During this period always watch the food label for wheat or wheat gluten. After you have recovered completely you can introduce these foods back slowly in your diet. Normally, for many people diarrhoea is caused due to a virus infection like stomach flu etc. or bacteria. In these cases the only cure for diarrhoea is time and rest. Now, people with a healthy immunity system will be able to fight the infection easily and the disease subsides within 1-10 days for most of the people. 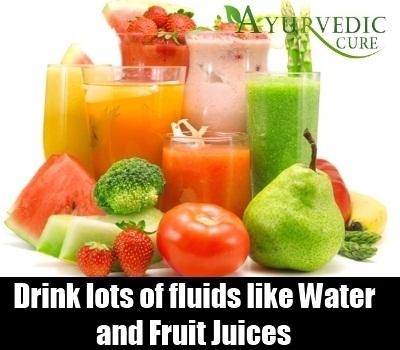 Many people also do not require the help of a doctor and need to stay hydrated only. 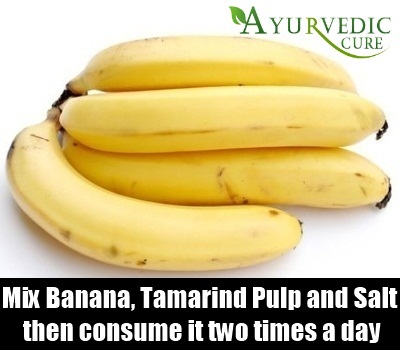 You can always eat a banana mixed with 1 teaspoon of tamarind pulp and a pinch of salt. If this particular mixture is eaten 2 times a day then you will see the difference shortly. You can also treat diarrhoea by eating a pomegranate. 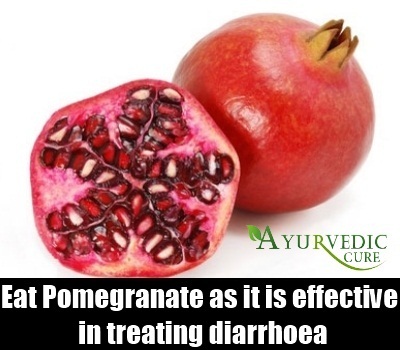 The astringent properties of a pomegranate are known to be really effective in treating diarrhoea. If a patient seems weak due to the bout of this disease then he/she must be administered pomegranate juice. This will help in controlling the diarrhoea. This cure is really hard to believe but is also known to be really effective. You will have to put some salt on the belly button, cover that with some strips of ginger and then heat the area with the help of a cigarette. 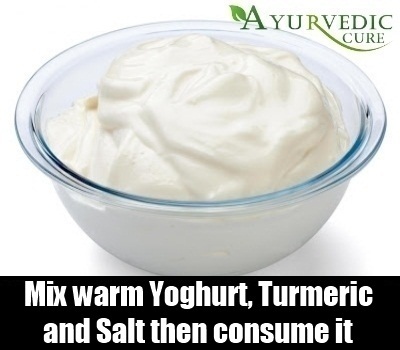 This helps in stimulating the spleen that will in turn aid in controlling your stomach. You will have to warm the yoghurt for 10 seconds in the microwave, or heat it on the gas for two minutes. Add turmeric and salt and mix. You can then drink this liquid concoction three times a day. If you are suffering from severe diarrhoea then visit a doctor immediately otherwise you might suffer from dehydration. 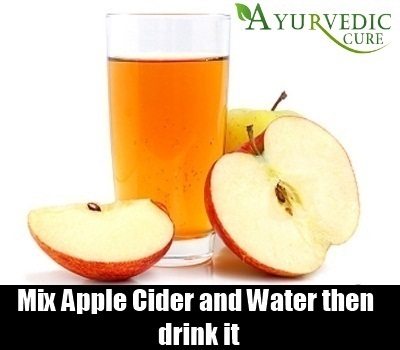 Mix apple cider vinegar in some water or juice. Drink 2 tablespoon of this concoction and repeat till diarrhoea vanishes. 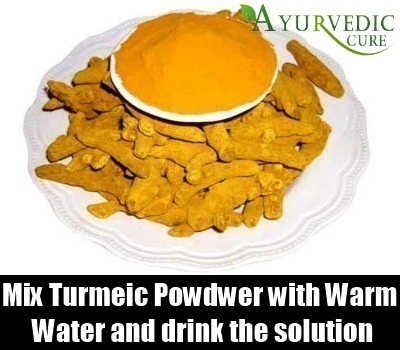 You can mix 1 teaspoon of turmeric powder in some warm water and drink this concoction. The turmeric will help the stomach to settle down, heal the digestive system and the intestine. You can repeat the dosage until the complete symptoms go away. 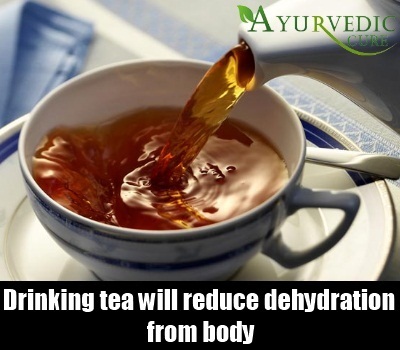 Drinking tea will reduce dehydration from your body. You can drink black tea, chamomile, blackberry, ginger or other flavours. You can also add lemon to your tea. You must alter your diet immediately when diarrhoea symptoms show up. 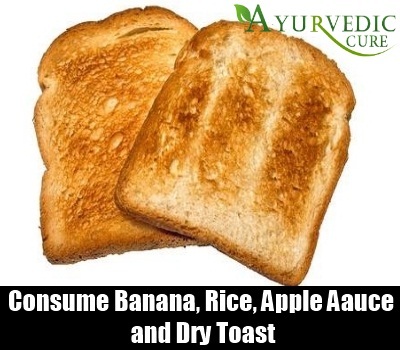 BRAT diet is mostly recommended by the doctors and it comprises of banana, rice, apple sauce and dry toast. But you must use this diet only when required so that the problem does not get worse. You must stop eating for the next 24 hours when diarrhoea strikes. Food can be taken sparingly in moderate cases. Start adding soft food in your diet when stool begins to form. There are a lot of places where carrot juice has been named as a cure for diarrhoea. You will have to drink at least 3 glasses of it in one day. 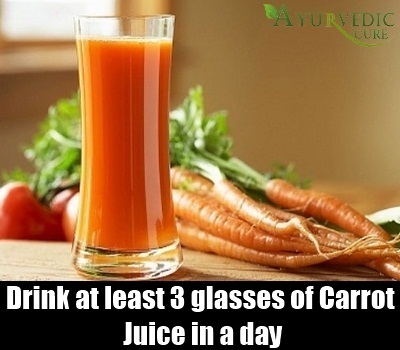 Drinking fresh carrot juice is advised but packaged will also work well. When you acquire diarrhoea, you must concentrate on drinking lots of fluids, sports drink, tea, barley water, fruit juice, fresh lime water etc. But always try and avoid coffee, carbonated drinks, alcohol etc. these are certain beverages that will only aggravate the disease. Water is the greatest gift to the humans. This is fresh always available and also helps in keeping the digestive system, stomach, intestine cool. 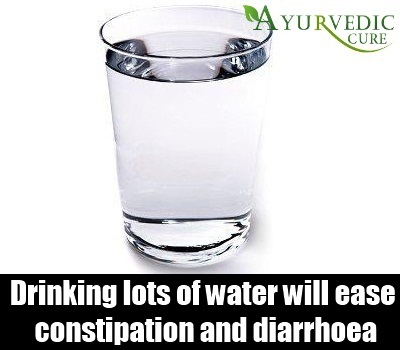 Drinking lots of water will ease constipation and diarrhoea. To avoid dehydration in diarrhoea, you can mix equal quantity of salt and sugar in a glass of water and drink this concoction. Drink this liquid in regular intervals. 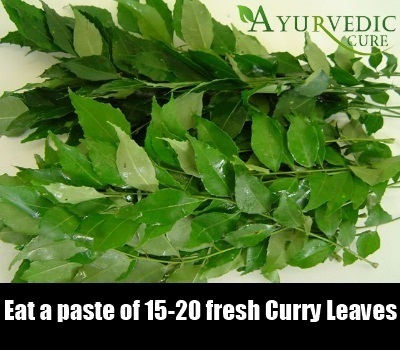 The best home remedy for diarrhoea is to eat a paste of 15-20 fresh curry leaves. This is known to be helpful for diarrhoea. You can also mix honey to enhance the taste. 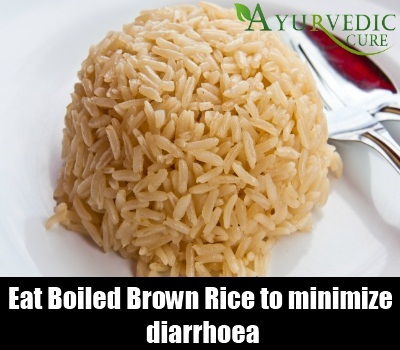 Brown rice is also a good home remedy for diarrhoea. This is simple and has maximum fiber content. The fiber will aid in adding the bulk to the stool and minimize diarrhoea. Eat boiled rice and you can also drink the starchy liquid for better treatment. 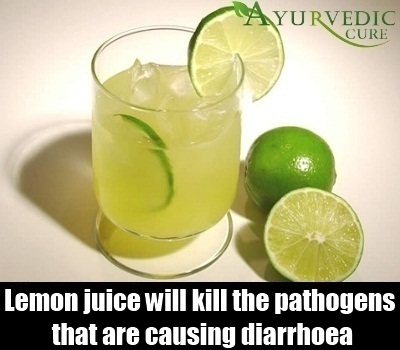 Lemon juice will kill the pathogens that are causing diarrhoea in your body. You can mix a juice of one lemon in a glass of water and drink this concoction at regular intervals. This will rehydrate your body too.